All stained sections are mounted with DPX and cover slipped. Sections are available unstained as listed below, or with a stain applied (see stain option table below). All stained slides are supplied with a printed label, detailing the section and staining method applied. We have listed only a limited (histology) section of our slides, please enquire if you require a tissue or stain that is not listed. We can provide a large variety of sections for many disciplines, including botany, bacteriology, veterinary and more. The unstained slides in the previous table can be modified to order. Please see the table below for the options. If the option you require is not available, please contact us and we will do our best to accommodate you. To order a slide with a slide option, please quote the unstained slide code with the suffix of the option that you require. For example, to order an Artery T.S. 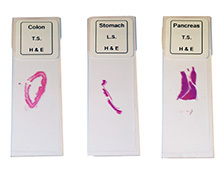 slide with the Haematoxylin & Eosin staining option, quote code CBUS-A/EH.